September is National Campus Fire Safety Month, and Campus Firewatch, in partnership with First Alert and the Michael H. Minger Foundation, is supporting communities doing Town/Gown Fire Safety Community Service Projects. The goal of these projects is to get students working alongside fire fighters in doing home safety visits and installing smoke alarms donated by First Alert. By doing these home safety visits, they are helping to make their communities safer and learning fire safety at the same time. Many communities are already doing home safety visits and installing smoke alarms – this project is just about adding students to your team!If you are looking to do a Town/Gown Fire Safety Community Service Project, there are a lot of resources available to help you pull one together, and we’ve assembled them for you in one convenient place. See how one student was so inspired that she took it to the next level! Additional information about college fire safety is available on the websites for the United States Fire Administration and National Fire Protection Association. This is a one-page summary of the current stats on fatal college-related fires. This is incredibly useful when you are putting together information about the impact of fatal fires, how many have occurred, etc. Since 2005, every single college-related fire has occurred off-campus, which is where the majority of students live. This is a concise checklist of the most important things to consider when looking for an off-campus house. Yes, these tragedies happen across the country. Campus Firewatch has created a great visual aid that you can embed onto your website showing where they are happening along with thumbnail sketches of each incident. This is a national campaign that is a collaboration between Campus Firewatch, the National Fire Protection Association, the U.S. Consumer Product Safety Commission and the U.S. Fire Administration that encourages parents to see the place where their child will be living before any lease is signed. This is the campaign we are doing in Massachusetts focusing on the importance of smoke alarms and two ways out in off-campus housing. If you are looking for model language to use in a local proclamation, this is a link to the one that I send out every year to the nation’s governors asking them to sign proclamations. Under a Fire Prevention and Safety Grant, the Michael H. Minger Foundation developed a collection of tools to help schools and communities do community service projects. A short training video that explains how to install a smoke alarm. A one-page handout that covers cooking safety that can be used to help educate the students and be given to the homeowner during a home safety visit. A one-page handout that covers the importance of knowing two ways out that can be used to help educate the students and be given to the homeowner during a home safety visit. A one-page handout that covers smoking safety that can be used to help educate the students and be given to the homeowner during a home safety visit. Many fire departments are already doing home safety visits or, more commonly called, smoke alarm installs. You can approach them with the idea of having students go with them on these visits, which will provide them with more personnel, expand their reach into other areas of the community (such as off-campus housing) and teach the students about fire safety at the same time. This is a winning solution for everyone all around! If you are a fire department looking to expand your pool of resources and involve students in your programs, there are some very distinct benefits to a Campus Fire safety Community Service Project. It provides you with an opportunity to engage with the students in your community in a very positive way and build a relationship with the school. This is a partnership that can help in making both the community safer and the students more knowledgeable about fire safety. Schools have a number of service organizations on campuses that are often looking for a project. -Frequently, fraternities and sororities are required to have community service projects. The schools may require that all students do community service. -A fast-growing trend are community service spring breaks where the students take on projects during their spring break. -Faith-based organizations are also another great resource to look into for students that are looking to give back to their communities. -Some schools offer community service projects for the incoming freshman class during orientation. The tragic impact of off-campus fires. This is a series of short videos featuring students giving fire safety tips in a direct, powerful way. The Clery Center was awarded a Fire Prevention and Safety Grant to develop a training program and video focusing on off-campus fire safety. The Vision 20/20 Project’s Fire Safety Materials Generator helps you design and print customized door hangers, flyers, refrigerator magnets and develop social media messages for a variety of audiences and occupancies, including rental properties. The Vision 20/20 Project has developed an app that lets you show videos on a tablet or smartphone when you are doing home safety visits. Covering four topics and seven languages, it is a valuable tool when working with different groups within your community. United States Fire Administration The USFA has a wealth of material available for you to use, including a comprehensive report about off-campus fires, statistics and handouts. 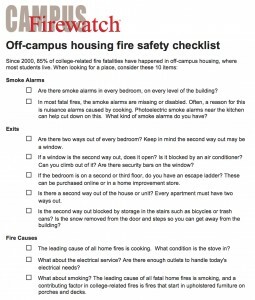 National Fire Protection Association has tip sheets, infographics and more on their site for campus fire safety.